Brandi has always been fascinated by the practice of pharmacy. As a child, her brother and her would visit a locally owned pharmacy with a soda shop. "I would see the pharmacists walking around in their white coats being so friendly and helpful to the customers. I believe that was when I first decided to become a pharmacist." With that idea in mind, she began my undergraduate career at the University of Tennessee. Brandi found an opportunity at a locally-owned pharmacy close to home and worked there as a pharmacy technician for the last 2 years of my undergraduate studies. Falling in love with the small town feel of working at a independent community pharmacy, she entered a pharmacy program with goal of becoming a small town community pharmacist. At the University of Tennessee Health Science Center College of Pharmacy in Memphis, Tennessee, Brandi's studies focused on evidence-based medicine and offered diverse pharmacy practice experiences in both inpatient and ambulatory patient care. 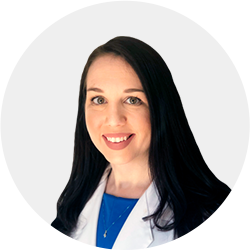 Her advanced pharmacy practice experiences include internal medicine, critical care medicine, infectious disease, sterile and non-sterile compounding, veterinary pharmacy, and independent community pharmacy. Throughout these experiences, she discovered a passion for patient interaction and patient education. After graduation, she returned to the same locally-owned pharmacy she worked at all through college. "I loved the personal relationships I had developed with my patients and local practitioners in this small community practice. I focused on building a compounding practice that provided personalized medications in strengths and dosage forms tailored to meet each patient's individual needs." Outside of her pharmacy practice, Brandi enjoys spending time with her husband and one year old daughter, Charlotte. They love visiting the neighboring Great Smokey Mountains and spending time on our local, Norris Lake. 12 years in community pharmacy experience.